Legislative Oversight Committee hears phoned-in testimony of Deputy Attorney General. The state’s legal team may challenge some, if not all of the $32 million in state tax credits already awarded to movie and TV projects filmed in Iowa. Deputy Attorney General Eric Tabor briefly testified by phone before a legislative committee this morning to update lawmakers on the criminal investigation of the state film office. Governor Culver fired the film office director in September and shut down the film tax credit program after revelations of shoddy bookkeeping and possible abuse of the program, like tax credits claimed for the purchase of luxury cars and iPods. The $32 million in tax credits for movie and TV productions does not include the dozens that were pending when the program was shut down just over a month ago. The tax credit program had several legal restrictions. For example, the credits were for goods and services purchased from Iowa-based businesses, but investigators believe some movie producers ignored that restriction. Olive, like nearly every legislator, backed the program’s creation, as supporters argued it would help create jobs for Iowans. Olive says legislators have to ask several questions once the criminal investigation is complete. 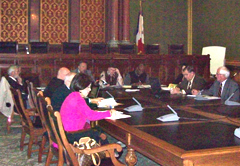 Representative Vicki Lensing, a Democrat from Iowa City, is the other co-chair of the Legislature’s Government Oversight Committee. She asked Tabor to give lawmakers a plan for redrafting the rules for the tax credits for film productions. On September 18, the governor ordered the state’s film, television and video promotion program suspended until “all reasonable questions about the administration of this program are answered.” A few weeks ago a key lawmakers suggested the program could be suspended for at least a year and some lawmakers say it should not be restarted.